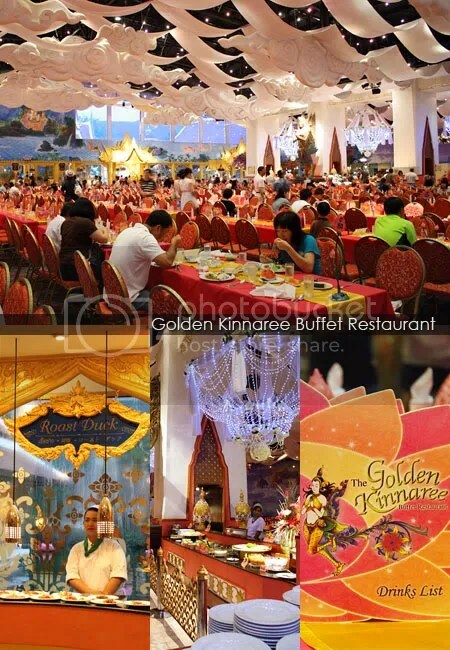 Golden Kinnaree Buffet Restaurant, FantaSea Cultural Theme Park, Phuket | Ipoh Mali Talak Sombong! Continue from my recent Phuket trip back in August 2010, we were lucky to be picked by Laguna Resort’s sales person to visit the Laguna Resort (and listen to a membership sales presentation after that) at Jungceylon, the biggest shopping mall in Phuket. Lucky, you say? 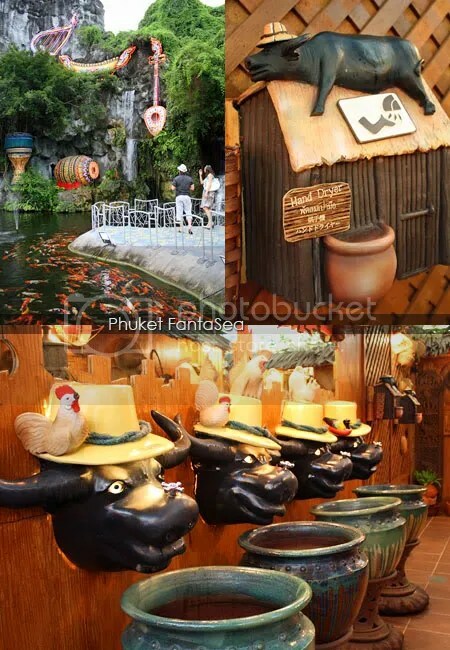 Because we’ll get two free tickets to visit FantaSea, the night time cultural theme park worth 790Baht each, inclusive of international buffet dinner, stage show and transportation after the tour! 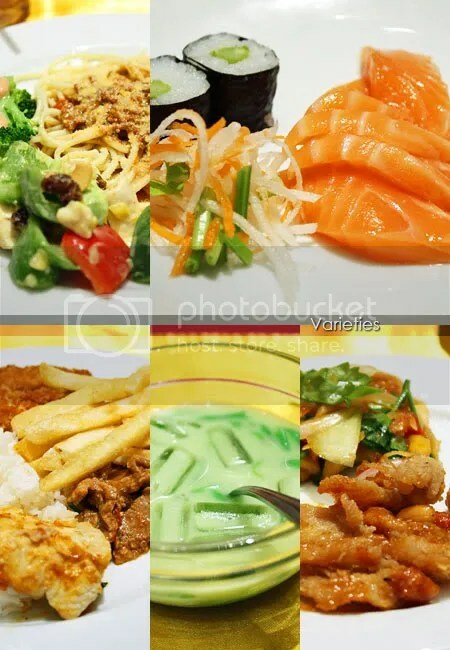 The ticket consists the portion for the buffet dinner and a mini map as well. 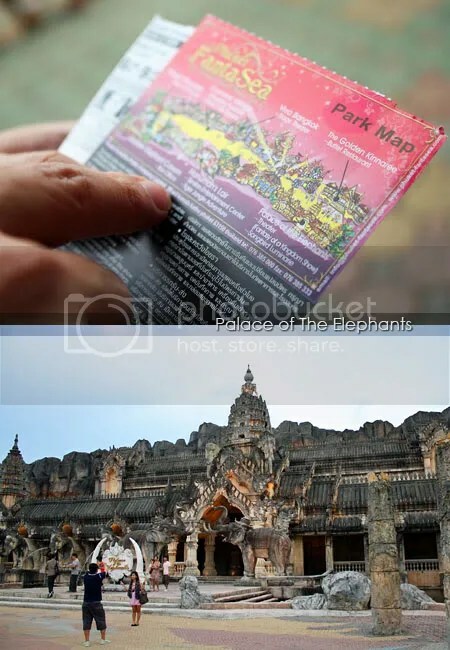 There are a few attractions here, the Safari (can see white tigers here), arcade, Palace of the Elephant (which is the theater) and some shops. But we found the most interesting part was the toilet! Buffalo hand dryer! Buffalo head-shaped washing basins! The water will come out from the nose! Hahaha.. so cute. We were really amused with the decorations of the toilet, we were rather hesitant to leave LOL. We were standing outside the toilet for a while and whenever visitors came out, they would laughed to themselves. Hehe. Buffet dinner starts at 7pm. Tables and chairs are arranged in rows in the enormous hall, similar like those in canteen, but much grand-er with numbers. The ladies at the entrance will guide you to your table based on the number printed on your ticket. There is a section separated only for the Muslims (halal section), but we did not see anyone sitting there though. There are counters all around the hall, with a few stand-alone ones dishing stuff like roast duck, sushi, sashimi, Vietnamese beef noodle and so on. There is also a section for vegetarians as well. You do not have to get the drinks from the counters though, as there will be waitress coming over to take your order. For your info, drinks are not included in the ticket price, you would have to pay them separately. Here are some of the items I had. Clockwise from top left: Bolognaise spaghetti with Hawaiian salad (spaghetti so so, but the salad was ok with a special dressing), cucumber maki and salmon sashimi (maki was too mushy, sashimi was ok), some Thai chilli chicken and dried shrimp salad (very crispy dried shrimp but the chicken was a bit hard to chew), honeydew with pandan dessert (refreshing!) and rice with grilled snapper fillet, fries and tomato beef (fish was dry and beef were tough). Verdict: Go for the desserts instead! Oh, and don’t miss out their milkshake. That was a very thick and creamy but not too sweet strawberry milkshake. Good stuff! After the dinner, all guests will proceed to the Palace of The Elephants at 9pm. It is a cultural stage performance, depicting the legend of Kamala (Prince Kamala with his magical elephant) with some acrobatic moves and illusion projection. If you’re tired of the beach activities in Phuket, or has no plan at night, try FantaSea for a change, you might love it. 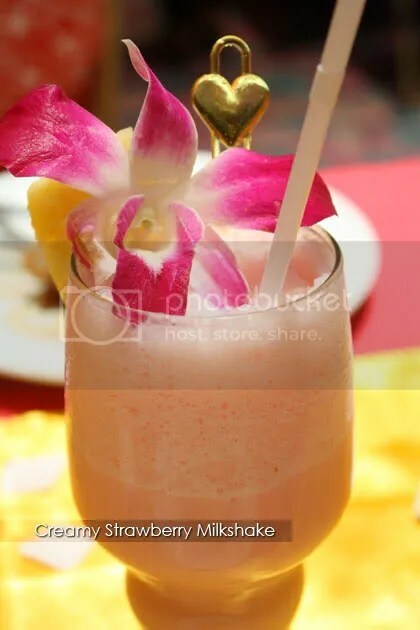 This entry was posted in Food (Phuket), Type: Fusion by Jason. Bookmark the permalink. I would love to go Phuket once again .. maybe next year.. must look out for the cheap tickets! Lucky you, got to eat and travel! I loved the toilet too, and I am sure the children will loved it even more. By the way, the thick salmon looked delicious and so too the dessert! I really amazed by the animals appeared in the show ! love phuket. love any beach place in Thailand for that matter.. i wanna go back now! Lol at the buffalo hand dryer.